At her facility in Endicott, New York, Casey offers a variety of group and private services for pet owners and assists her business partner in hosting workshops for the Karen Pryor Academy. 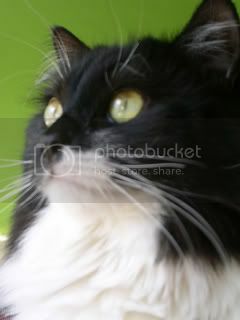 She also offers consultation services, including written web content and print development, for other pet professionals. Casey is available for limited lecturing engagements upon request. Graduated with distinction from Karen Pryor Academy, widely recognized as one of the world’s premier schools for modern trainers. Served on the inaugural Alumni Advisory Board for KPA, continues to assist in workshops with new students and mentor students post-graduation. Casey is serves as the Secretary for the Board of Directors for the Association of Pet Dog Trainers, the world’s largest organization for animal behavior professionals. Contributor for various print and web media, with hundreds of articles published on the internet’s top websites for animal training and behavior including Karen Pryor Clicker Training, Dog Star Daily, Dogster, Dog Lover’s Digest, Tails Pet Media Group, The Association of Pet Dog Trainers Chronicle of the Dog, Nicole Wilde’s book “Don’t Leave Me! Step By Step Help For Your Dog’s Separation Anxiety,” and won the prestigious John Fisher essay award from Dogwise in 2009. Technical editor for Laura Baugh’s best-selling book Fired Up, Frantic, and Freaked Out: Training the Crazy Dog from Over the Top to Under Control. Available on a limited basis for pre-publication book, article, and web media copy-editing and content creation. Commitment to continuing education – new dog training book or video? I’ve likely read or seen it. Big conference or seminar? I’m there, eager to learn new ways to help my clients and their dogs find mutual success. Client, professional, and veterinary references available upon request. When she’s not training, writing, attending conferences or seminars, Casey can be found: reading (lots of training books and a few great novels), attending conferences or seminars on dog training, behavior, and health, hiking through the woods with Jim and the dogs, playing with her new camera, camping, attending to the grooming needs of the resident three and four-legged furkids, cleaning slobber off the ceilings, muddy paw prints from the floor, hunting dust bunnies with the Dyson, preparing training treats, making home made dog toys, or snuggling puppies. 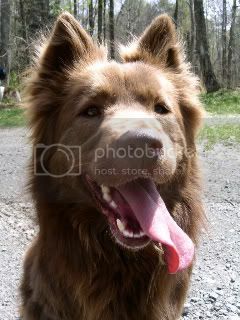 Mocha Bear is our wonderful chow mix. She is aloof, intense, independent, haughty, challenging, and ridiculously smart. She is an amazing training partner, and deserves as much credit as I do for graduating KPA, since she worked in all my lessons, workshops, and assessments. She always makes me look good as a trainer, and never fails to make me proud. I am perhaps most proud of her for helping her realize that dog breed stereotypes are the canine equivalent of racism and must be abandoned. Mokie has rehabilitated a number of “Chow” phobic clients, teaching them that it is training, not breed, which determines a dog’s threat to public safety. She also travels to various camps and seminars with me as a demonstration dog. When she’s not helping me at the classroom, Mokie enjoys chasing squirrels, playing with her best friend Leila, shoving her face into gopher holes, playing with sticks, swimming, and playing her Fisher Price piano. Cuba Gooddog Jr. (Shadow Mtn Victory for Monte) Most photographed puppy in the universe, star of Puppy Socialization Diaries on RBDT, world traveler, cutie pie. In August of 2010, Casey flew to Oregon to bring a new Saint Bernard puppy into the Lomonaco household. She returned with Cuba (jokingly called “Cuba Gooddog Jr.), registered name Shadow Mtn Victory for Monte. Cuba is named after the town in New York State from where Monte was rescued. Cuba is an unruly adolescent who is still very much learning his manners, but is a wonderful teacher and student to his mom, and is getting better and better every day! Montecristo: Saint Bernard,guardian angel, artist, garbage raider, interior designer, slobber distributor. 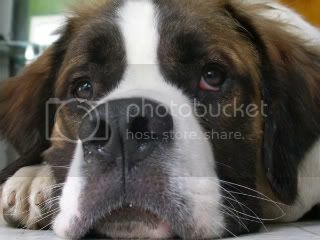 Monte was our rescued Saint Bernard. Sadly, we lost Monte just weeks before his sixth birthday in the summer of 2010 to a congenital birth defect. Monte is unbelievably missed in our home, and is the inspiration behind Ode to Boy: Tributes to Crossover Dogs, also known as Project Monte. Monte is the most inspirational dog I know, and was a devoted companion, thoughtful mentor, and made me a better person, trainer, and dog mom. I miss you, baby boy. Momma loves you forever. Ahab the three-legged cat and Eartha Kitty, who so kindly let the rest of the Lomonacos reside in the home they have claimed. 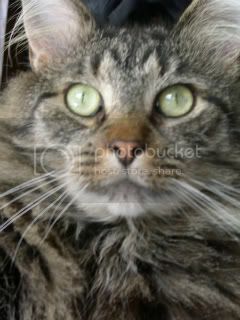 Ahab was feral in a few of his nine lives. He is a cunning escape artist, and is still trying to come to terms with the fact that he is destined to be an indoor kitty. While initially upon coming home with us he was very frightened and spent most of his time looking for hiding spaces, he is now really quite socially gregarious, and has a reputation with all visitors in the Lomonaco home as being the world’s cuddliest cat. Ahab’s true dream is to be a therapy animal, and have thirty to fifty people all vying for their turn to cuddle him at the nearest hospital, nursing home, or rehabilitation center. Ever the diva, Eartha works “behind the scenes” in the Lomonaco residence. Always wary of Monte and the slobber he brings, she prefers to bask in the sun on top of floor-to-ceiling cat furniture. Never having been outside in her life unless going to the vet since she first came to us, she thinks the outside world is terribly dirty and undignified.